Osteon Medical’s Bi-Axial system provides angled screw channels that allow for optimal positioning of an implant crown or bridge. The ability to angle screw channels by up to 30 degrees from the straight-line axis gives more flexibility when designing implant-supported crowns and bridges. 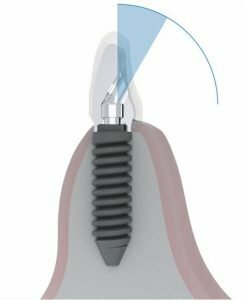 When placing a direct to fixture restoration, the abutment screw and access channel goes through the middle of an implant crown. For posterior cases, the access is usually through the occlusal surface which can easily be restored with a composite restoration. However, with implant crowns on anterior teeth, often the angulation of the implant would result in a screw channel exiting through the incisal edge or labial surface of the crown, creating an aesthetic problem. This is where the Bi-Axial system provides a more suitable alternative. The screw channel can be angled so it’s accessed from the palatal or lingual surface of the tooth. The technique is straightforward and simple to use. The alternatives to angled screw channels in anterior implant restorations involve either cross pinning or cementing implant crowns to abutments. Cross pinning involves more laboratory work, meaning greater cost for the patient. Cementing implant crowns can be problematic due to difficulty in removing residual cement. The Bi-Axial system is a cost-effective technique that provides another option. There are still situations where I may prefer to cross pin but in the cases I’ve done to date, it has worked well. As I’ve only been using this system for a short time, I haven’t come across any negatives. If anything does go wrong, Osteon provides a warranty to replace the implant and abutment.